Comments - Terrific scene from the famous tale of the Soga Brothers. 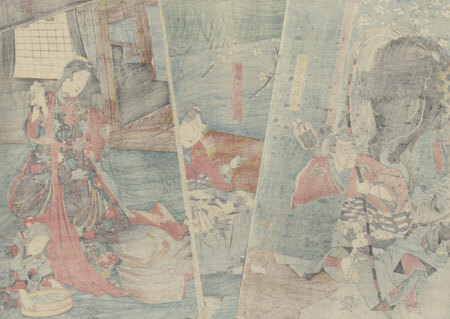 Here the older brother Soga Juro pays a visits to his beloved courtesan, the beautiful Tora gozen. He sits beside an oil lamp, writing a final poem, knowing that tomorrow he may face his death when he and his brother finally avenge their father's death. The beauty smiles at him gently as she holds a comb, a young attendant placing a basin of water at his feet, unaware that she may never see him again. 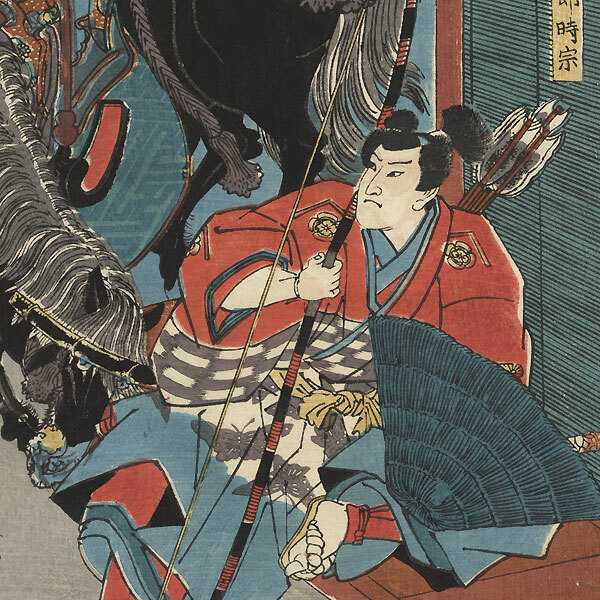 His younger brother, Soga Goro, waits patiently outside, holding his bow and hat, his horse nearby. A full moon glows softly in the night sky, framed by the delicate white blossoms of a cherry tree. A lovely and poignant image, with beautiful detail in the handsome interior setting. Condition - This print with excellent color and detail as shown. Three separate panels. A few wormholes, repaired. Slight soiling, a few creases, slight rubbing at edges. Please see photos for details. Good overall.